Twice against Air Force, a play ended with a holding flag. The ref turns on his mic, "Holding," Woooo, "Number 73 of the defense." I had never heard of a defensive linemen getting called for holding on a running play before and since I'm not watching the defensive tackles for potential holds, I didn't see it during the game. 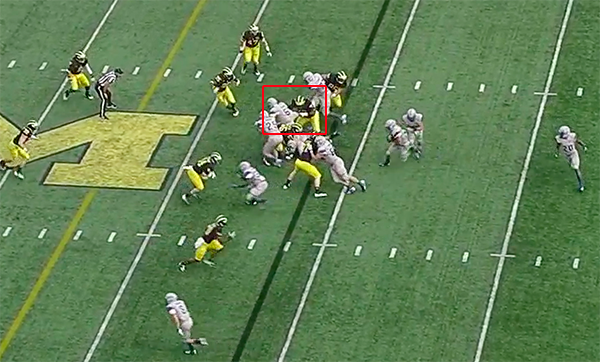 But it turns out, Campbell basically tackled the Air Force linemen to stop them from releasing to the second level. On this play, the hold didn't make a difference, but I would venture to say that the Air Force coaches ask the refs to look for this before the game begins because I hadn't ever seen this called before. That's all. I was confused in real time and assumed other people wanted to see it again as well. I've seen it called on NTs in 3-4 defenses in the NFL who try to occupy two blockers by holding them.